Who has the better chance of winning a belt in the weight above? Discussion in 'UFC Discussion' started by Vomit Inducing Brutality, Jan 11, 2013. Anyone voting for Jones is out of their minds...Jones would be a substantial dog vs Cain. A live dog, but still a significant underdog. Aldo would be the betting fave over Bendo. He's over -200 against Frankie for goodness sake. 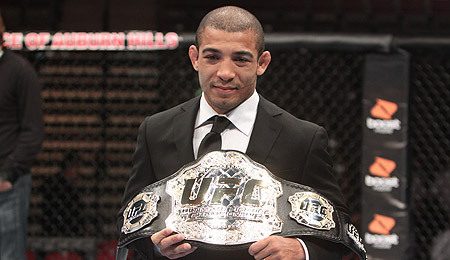 As long as Bendo has the belt, Aldo is the favorite of those two. How they have a women's div and a 35 men's div but no super Heavy is a wonder to me. Aldo. Cain would wreck Bones. I went with Jones. I don't think Aldo could beat Maynard. 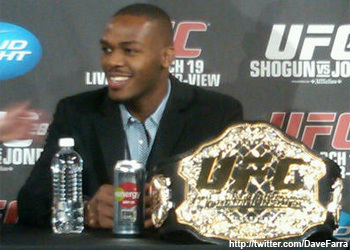 I do believe Jones eventually will have that HW belt. Aldo. Bendo's not even a legit champ. EDIT* It does say "Chance",so. And who would fight there, Sean Mcorkle, Jimmy Ambriz, and Bigfoot? Ya we can't wait to see 300lb guys fight...tony Lopez was shw champ ...he just lost at lhw..catch drift?